Bivouac comes from the eighteenth-century German word biwacht, and originally meant a patrol of ordinary citizens who helped the town’s night watchmen. Nowadays, you’ll most often see it used as a noun, but it can be a verb too––and it’s often associated with soldiers, though that’s not essential. You might not want to bivouac at the edge of that cliff when you sleepwalk every night. Make your bivouac in the meadow instead. At first, the word sounded so alien to me. I can’t recall a single time that this word’s been uttered. 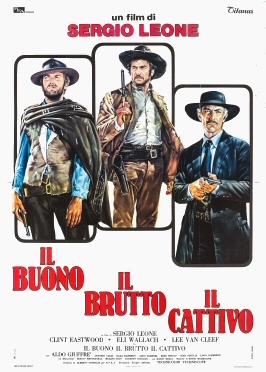 Apparently it’s somewhat more common than I had originally thought, when I heard it used once in The Good, The Bad, and The Ugly. 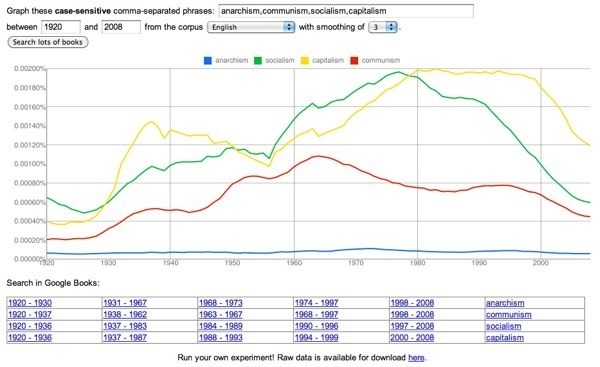 According to Google N-grams, the usage of bivouac peaked roughly towards the end of the American Civil War. Although the usage of the bivouac has been in steady decline since the 1900’s, it’s managed to cling on to even pop culture! E-reader app cornucopia on the iPad! As a dedicated reading device the iPad does not disappoint on content, formatting and features. The only major drawback, the battery life, might negate all the enthusiasm which follows. I will keep this ipad for a week longer to see if I can get by without it and with just my e-ink kindle. 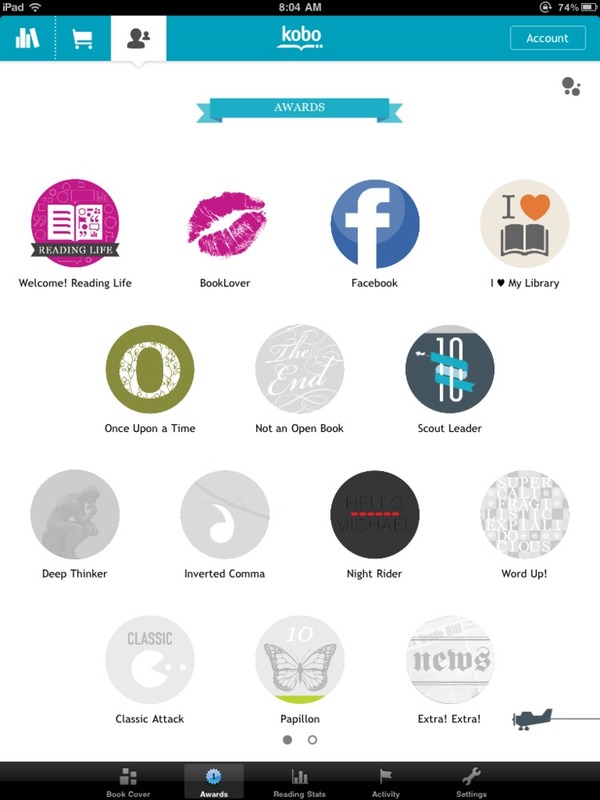 The Kobo app is a very cute e-reader with an achievement system. The achievements won me over immediately (because I’m a raging achievement whore and ) for being completely unique among all other reading apps. 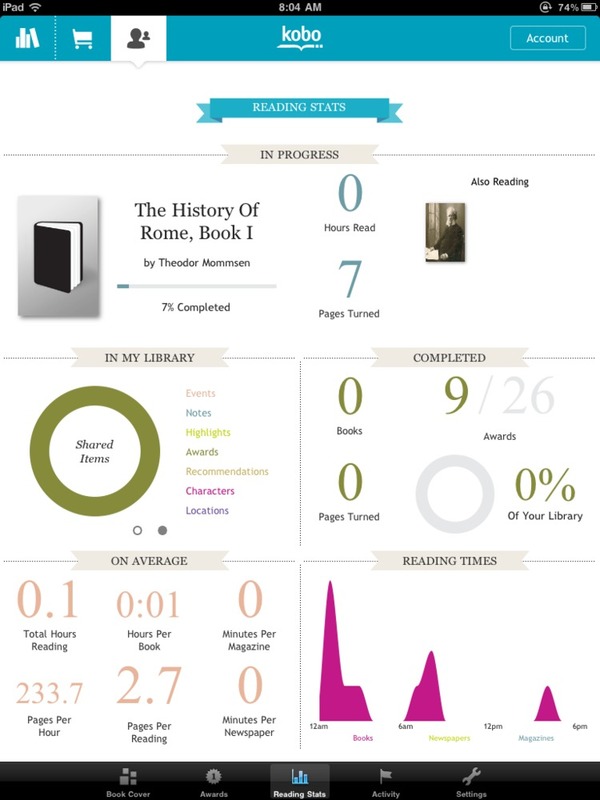 Kobo also has a reading statistics page that now seems like a grossly overlooked feature by all other apps. There is also a built in sync to Instapaper, without the document type limitation of the Kindle-Instapaper syncing. This app would make me more receptive to the Kobo e-ink reader if the device were cheaper than the Kindle’s $139 reader. The Kobo device, based on the gadgety blogs, is unfortunately only a bare minimum reader that has a slightly smaller form factor than Kindle 3. My next favorite, the iBooks app, allows me to breeze through my PDFs. No other reader really lets me view my own documents, let along PDFs. The missing feature is that i cannot annotate my documents. The other reader which comes close to allowing some sort of open-ish platform is the Bluefire reader for allowing library book borrowing. Bluefire also has a good built in book store that promotes free indie books. This app claims it gives you a choice between EPUB and PDF, but I found that the PDFs would not load. Stanza has a great built in book store and has a section for downloading sheet music. 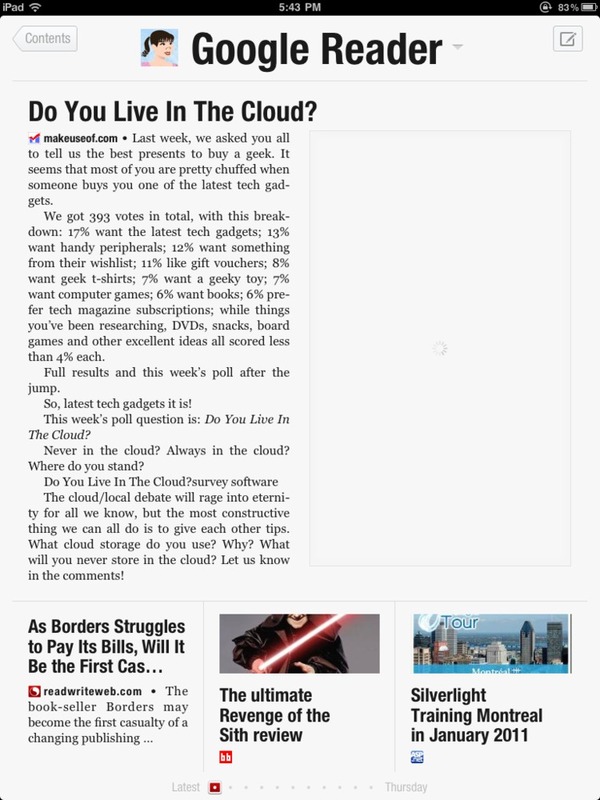 Flipboard is absolutely amazing. Screenshots do no justice. The Kindle app is cool because it syncs my activities between my iPad and kindle e-ink device. Gourmet live is among the few free and useful magazine apps. The Nook app was underwhelming, but that was mostly because I didn’t want to give them my credit card information just to sample a free book. I never got far enough to read anything on this app so I can’t even pass judgement. I also do not like going to Safari browser to do my shopping, but that is probably Safari’s fault. 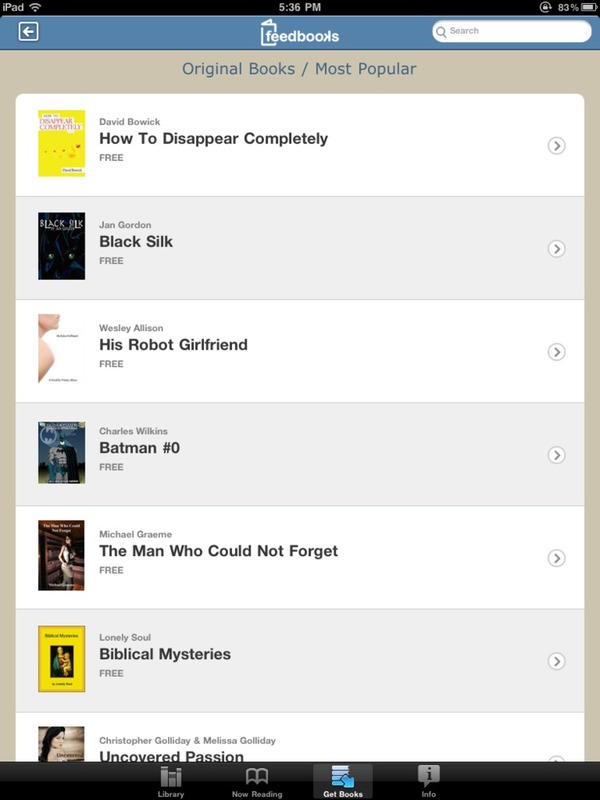 SafariBooksOnline.com‘s mobile site was my only alternative to their reneged ipad app. The formatting is tolerable but there is a notably missing swipe-to-turn-the-page feature. The Google books seems to be something like a clone of Kindle free collection and a poor clone of the rest of Kindle’s collection. Google also does not have an in-app store, but instead has a web store that borders on ugly and spartan. Their free books usually starts out with a few scanned pages and then switches to OCR, which is interesting but not really aesthetically or functionally valuable. Every app has something very outstanding about it, and there isn’t one app that rules them all. It would take that fully featured app to make iPad indispensable. Who will be crowned champion?